In some parallel universe, an Amherst College student might wake up in the morning, leave their dorm room in East College, skirt by Stearns Church on their way to class in Walker Hall, then go for a little exercise – perhaps in Barrett gymnasium or Pratt Natatorium. If they twisted an ankle? Off to Milliken Infirmary. After dinner in Hitchcock Hall, some study time in Morgan Library, a refreshing drink from the College Well and a quick trip to visit the fossils in Appleton Cabinet. This doesn’t sound like Amherst? 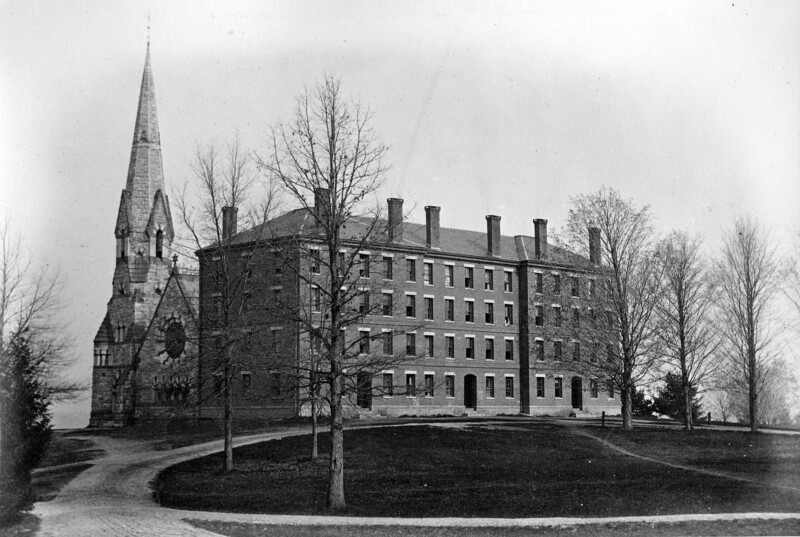 Let’s take a little tour of some of the bygone buildings of Amherst College. 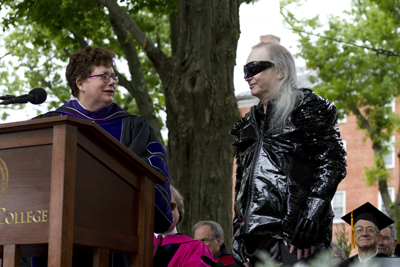 Jim Steinman (AC 1969), the phenomenally successful composer, lyricist, Grammy-winning record producer, arranger and performer, was awarded an honorary degree at the Amherst College commencement this May. Steinman (r) receiving the degree of Doctor of Humane Letters from President Carolyn “Biddy” Martin at the Amherst College Commencement, May 25, 2013. Steinman is still probably best known for penning such songs as “Bat Out Of Hell” and “Paradise By The Dashboard Light” on Meat Loaf’s album Bat Out of Hell—the second best-selling record of all time—and “I’d Do Anything for Love (But I Won’t Do That)” on Bat Out Of Hell II. But his work in musical theater is equally deserving of attention; for example, he wrote the lyrics in a collaboration with Andrew Lloyd Weber for Whistle Down the Wind (1996). The hoop-la surrounding the return of a veritable musical superstar to Amherst made me wonder about what Steinman got up to while he was an undergraduate. Given his high-gothic sensibility and the generally turbulent nature of the ’60s when he was here, it’s not surprising that the answer is: quite a lot, actually. While at Amherst, Steinman indulged his passion for musical theater by writing a number of rather daring works. Most notable among them was The Dream Engine, a rock musical that Steinman wrote as an independent study project in his senior year. Let’s have a look at this work, as documented in our Dramatic Activities Collection and our College Photographer’s Negatives Collection. 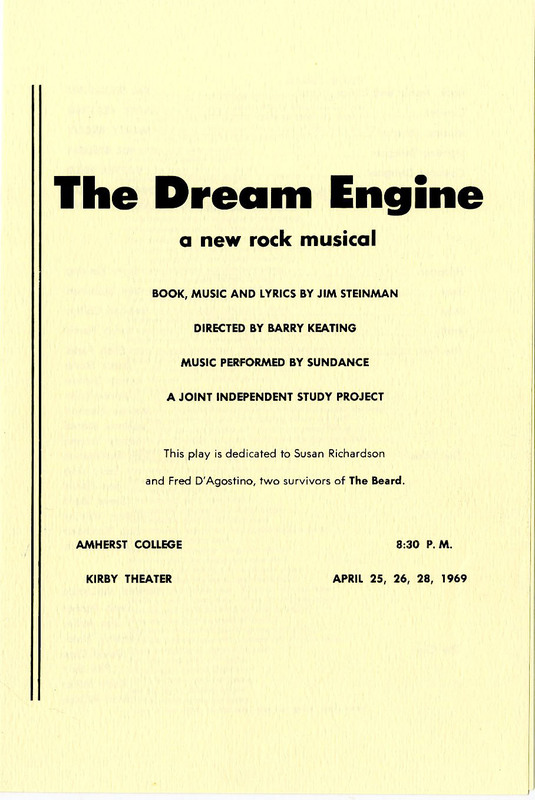 Cover of the program for the Amherst College performances of The Dream Engine. I recently gave an orientation to the Amherst College Emily Dickinson Collection to a group of fresh docents from the Emily Dickinson Museum which included a lively discussion of the poems that were published during her lifetime. Our collection includes copies of nearly all of the original publications in which Dickinson poems appeared, but today I’m going to focus on two publications and their ties back to Amherst College. Karen Dandurand dedicated much of her career to the question of Dickinson’s relationship to publication during her lifetime, and we have her to thank for discovering the poems featured here. Her 1984 article “New Dickinson Civil War Publications” includes all the details to accompany this brief illustrated tour.